The Yoga 4 Classrooms® Card Deck is a fun and effective tool primarily for educators, counselors and therapists to use with children for a peaceful and productive classroom. 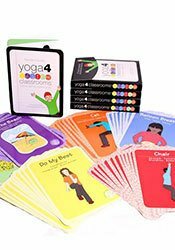 Larger 6"x8" boxed set features 67 yoga and mindfulness-based activity cards which include illustrated instructions, discussion points, sub-activities, and educational tie-ins, for a total of more than 200 beneficial classroom practices. The activities were specially chosen for their suitability for the typical classroom space. That means all activities can be done standing beside or sitting at desks, while bodies and hands remain off the floor, away from dirt and germs. The cards include a mix of yoga postures, brain boosting movements, breath exercises, visualizations, mindfulness activities, creative movement and community-building games. Wellness and character-building discussion points such as the power of positive thinking, nutrition, and being a peacemaker, address the whole child - physical, social and emotional. Absolutely anyone can use and benefit from the Yoga 4 Classrooms® Activity Card Deck - teachers, students, parents, therapists. No prior yoga experience required Yoga 4 Classrooms® Card Deck offers tools for learning and lessons for life. "A must-have resource for 21st Century teachers!". boxed set of 76 cards; 6" x 8"